To make PicoSure Laser Tattoo removable affordable and easy for you we've come up with a simple 3 Tier pricing system. Step 1: Book yourself a FREE PicoSure LaserTattoo Removal Consultation at SKiiNsure Laser Clinic in Newcastle. Step 2: Our highly experience Laser Clinicians will assess your tattoo to choose the price tier that it fits into. Step 3: Commence your treatment on the spot, or book your first treatment for another day that works for you. 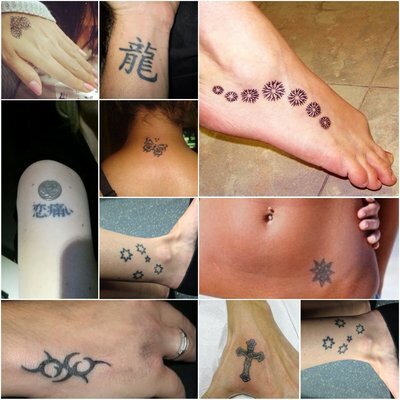 The collages below indicate the the types of Tattoos that fall into each category. The actual choice of Treatment Tier does not only depend on the size of the tattoo, it also depends on other variables like ink colours, density, age of the tattoo, type of tattoo, your skin type and more. 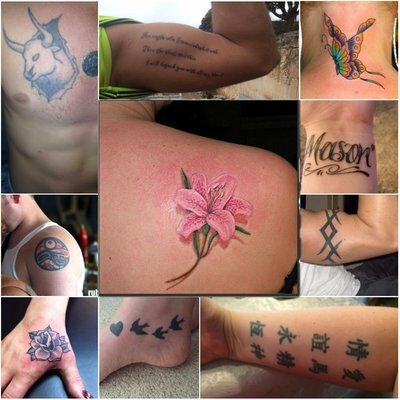 Your SKiiNsure Laser Clinician will discuss with you which Treatment Tier your tattoo best suits. This Treatment Tier is for smaller tattoos like the ones shown at left. If your tattoo is much smaller talk to your Laser Clinician - very small tattoos will attract a further discount. Each treatment session for these tattoos will be fairly quick and easy, with minimal downtime. Our PicoSure laser removes tattoos twice as fast as traditional "nanosecond" lasers. This Treatment Tier is for mid sized tattoos like the ones shown at left. Most tattoos that we treat at SKiiNsure Laser Clinics fall into this category. Some of our clients have tried older style nanosecond lasers in the past and report that our PicoSure picosecond laser is much leass painful. Larger tattoos will take longer in each treatment session but our Zimmer Cooler will help make the sessions more comfortable. Most people will be able to have their large tattoos treated in a one-visit session. If your tattoo is very large, like a half or full back, half or full chest, half or full sleeve you will most likely need to break each treatment session into multiple visits. To give you crertainty, we will give you an upfront price at your FREE Consultation. With SKiiNsure Laser Tattoo removal there are no nasty suprises. Once your Treatment Tier is chosen it's locked in for the duation of your tattoo removal journey*. Tattoos take multiple treatments to be faded or removed to your satisfaction. The exact number required can't be accurately determined before your treatment is commenced.